Happy Wednesday, friends. 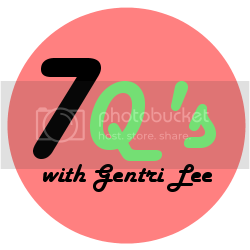 Today I'm linkin' up with a little series called 7 Questions hosted by Gentri Lee. Ready to learn more about this dancing queen below? Well allll right. P.S. I don't really know what I'm doing in this photo. I assume it's dancing... or general flailing about. Either way Jupiter (lower right) is not impressed. 1. Do you have any weird food combinations that you love? Do kale smoothies count? Hmm kale smoothies probably definitely count... I promise they're so good! Kale, apple juice, frozen peaches, fresh strawberries, ice. Blend that mofo. 2. Have you ever written a blog post, published it, then immediately deleted it? I've never done this... but in my early blogging days I did publish a post, decide I didn't really like it, and then publish another post immediately in hopes of "covering up" the first one. What?? Weird logic, eh? 3. What is a hair style you wish you could pull off, but would never be brave enough to try? Omg kind of digressing from the question, but I recently conquered a (really ridiculous) hair style fear: I really love the top knot and only recently got up the courage to wear it in public. I know, the top knot is everywhere! So silly. But I think I went 24 years of my life wearing my hair down. I'm strangely self-conscious of my ears... they're baby ears. I have zero ear lobes. Sharing this with everyone makes me realize what a silly thing this is to be self-conscious of, but it's true. Now I'm proudly facing my fear of being publicly ridiculed about my baby ears by rocking a top knot. It's funny how things we're self-conscious of seem HUGE to us, but in reality I bet no one even notices my non-existent ear lobes... and if they do, why are they looking at my ears? What WEIRDOS. 4. Would you rather have to always use the sun to tell the time or directions by the stars? Definitely tell directions by the stars. I live in Colorado, the mountains are always west... even if I didn't quite understand the stars, I'd still have my trusty mountains. Kinda cheating on that one... unless I was in the mountains. Hmm. 5. What is a fall trend that you are excited to try? Peter Pan collars! I'm so intrigued by these little gems. They're like the necklace's cooler, older sister who drives already and has a boyfriend in college. I especially love this one... or this one... oh! this! A fancy collar is the perfect addition to a plain ol' sweater. 6. Who is your style icon? Wow you know, I've never really thought about this one... I think I'd have to say Joy Cho of Oh Joy! I loooove her style and her Accessorize pin board is one of my absolute faves to peruse. I think she loves flats as much as I do, high five!! 7. What's your favorite outdoor activity? As I've admitted before, I'm not super athletic for a Colorado girl - especially for a Colorado girl! A few weeks ago, Kevin and I took a picnic and a bunch of books to the park and just hung out, reading and eating french bread and brie. Best. outdoor. activity. EVER.